PRONG has released their cover of the BAD BRAINS classic "Banned In D.C." off their forthcoming covers LP, and you can check it out below. Songs From The Black Hole will be released in the U.S. on March 31st via eOne Music. The release will be in tandem with SPV/Steamhammer special CD and LP edition available in Scandinavia on March 25, in Germany on March 27, and the rest of Europe on March 30. 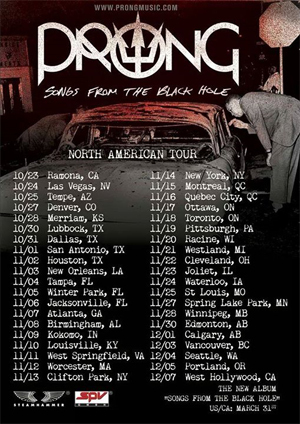 "PRONG is very excited about the upcoming release of our new record, Songs From The Black Hole," says frontman Tommy Victor. "We are equally excited about the artwork and packaging." The band has also announced a full U.S tour for the fall, a tour poster with dates can be seen below. Victor continues, "With the help of our art director Mike Lopez, the theme of urban decay, desolation, insecurity and ultimate change that prevails in the music has been brought to the surface in images. Since much of PRONG's origins come from a place of abandonment, we feel our new album artwork fully reflects this sentiment." The track list is far from traditional. With covers of artists like NEIL YOUNG, BLACK FLAG, BAD BRAINS and SISTERS OF MERCY, the band casts their net wide. The goal, says Victor, was to explore the vast landscape that makes up the bands sound, stemming from their roots. "Since the record explores PRONG's roots, musically and geographically, this needed to be expressed visually and this was attained."